I've been a Purex user for years now. Ever since someone asked me why I spent all that extra money on detergent when Purex worked just as well. I tried it for myself and haven't looked back. It's effective, it's inexpensive, even more so when it's on sale and I have a coupon. 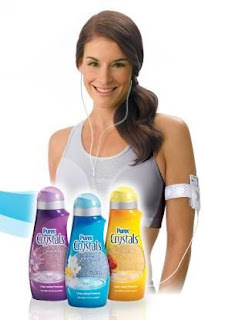 As a Purex Insider, I was recently introduced to the new fabric softener, Purex Crystals. Made up of 92% natural crystals that go in at the start of the wash cycle, Purex Crystals is perfect for someone like me, who often forgets to add the softener during the rinse cycle. I knew that you shouldn't use fabric softener when washing towels, because it will lessen the absorbency of the towels. But I had no idea that it mattered when you washed athletic wear. It does! Jockey sports bra has moisture wicking technology to keep you dry and your body cool while you workout. The oils in fabric softeners prevent this wicking process. 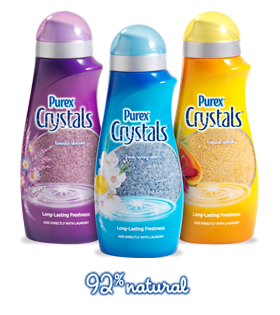 Purex Crystals don't contain oils so they're safe to use on your athletic wear, towels and children's sleepwear. Plus, because the crystals spend more time with your laundry the smell is infused with a longer lasting freshness. Right now Purex and Jockey are offering a coupon to save 20% off on a sports bra. But even better, you can win a great prize package right here. • Convenient key pocket so you can take your workouts anywhere! a bottle of Purex Crystals-Tropical Splash. Just leave me a comment below saying you'd like to win with your complete email address in the comment. Please leave a separate comment for each entry and a valid email address in your comment for the entry to count. Contest ends January 25, 2012. Disclaimer: Purex and Jockey provided me with samples of the products mentioned, for the purpose of review. All opinions are my own. Ok. I want the sports bra and the crystals. Let me win and nobody gets hurt. I've shared this post on FB. I've shared this post on Twitter. Hi! Me again...just so you know, your badge is not linked to your blog. Don't know why cause I'm not a geek, but it takes me to someone else's blog - something like naptown or something like that. It had "nap" in the title and the pic was DEFINITELY not you. I like Purex on FB. I like Jockey on FB. I'd love to win ... without leaving my e-mail in a comment. I've seen the crystals and wondered how they worked - would love to be able to try them free of charge - sports bra huh - - - -well does that mean I have to start working out? Yay! I finally figured how to post comments. Now I would like to win. I never used purex but know people who do and love it. i'd love to win- thanks for the giveaway!